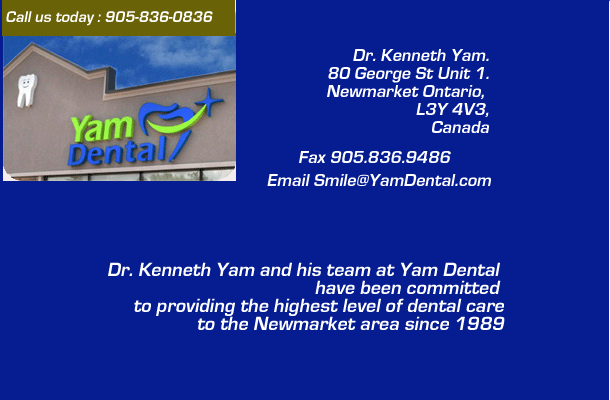 Dr. Kenneth Yam and his team at Newmarket Dentist office have been committed to providing the highest level of dental care to the Newmarket area since 1989. Newmarket Yam Dental is a team of dentists in Newmarket Ontario offering a good range of dental services for grownups and kids. It’s our mission to help you achieve long-term oral health and a pretty smile you will love to flaunt. Newmarket Dentists Team gives you a confidence boost and helps you feel better about your appearance! For patients who need an alternative choice to normal braces, we provide Invisalign Clear braces that quietly adjust and align teeth. Our friendly dentist staff will demonstrate proper oral cleanliness practices to help you maintain healthy teeth and gums. Newmarket Dentists welcomes people who reside in Newmarket, Aurora, and Richmond Hill and near by areas to come visit our Newmarket dentist office. If you have been looking for the best dentist in Newmarket, come and see us at Yam Dental is a dental office in Newmarket. When you’re looking for a family dentist in Newmarket, or area in need of tooth care, visit us at Newmarket dentist office. Schedule an appointment with us to see how we can make your smile brighter!